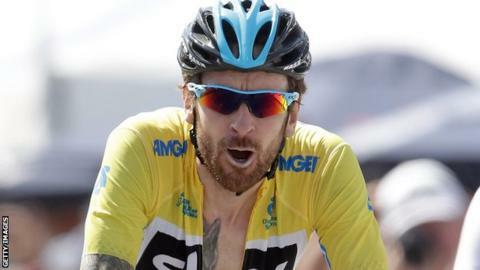 Britain's Sir Bradley Wiggins moved closer to a first win of the season by taking a 30-second lead after six stages of the Tour of California. The 2012 Tour de France champion, 34, was fifth in the 151.8km stage from Santa Clarita to Mountain High, 53 seconds behind winner Esteban Chaves of Orica-GreenEdge. Australia's Rohan Dennis is Team Sky rider Wiggins's closest challenger. Saturday's penultimate 142.8km stage is from Santa Clarita to Pasadena. After Friday's mountain-top finish, stage seven features a long climb from the start before a fast descent and a flat finishing stretch. Wiggins said he felt a first stage race win since September's Tour of Britain was in reach. "Today was the day, not that you fear it, but the stage you wanted to get through," he said. "There's always a danger in a day like today, with the heat and also attacks coming in the final 40 minutes. The team rode incredibly to put me in that position today." Wiggins took the race lead on Monday with an impressive 44-second individual time trial stage win over Dennis after compatriot Mark Cavendish opened the eight-stage race with a sprint triumph. 2. Rohan Dennis (Aus/Garmin) +30"